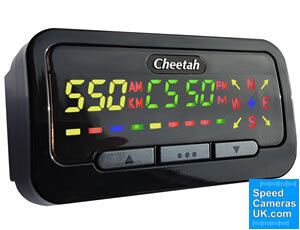 Cheetah c550 GPS speed camera detector provides advanced warnings to speed and red light cameras. Alerts are available for the UK and Europe, USA and Canada, and/or Australia and New Zealand - subscription charges apply. Buy accessories for the Cheetah c550. Want to buy the Cheetah c550 with lifetime unlimited speed camera updates and an extended 3 year warranty? Please see the Cheetah c550 Platinum model. The Speed Cheetah c550 speed camera and red light camera detector will provide a visual and audible countdown to every speed camera in the UK using GPS technology. The Cheetah has won the Auto Express Awards with a Best Buy Rating and 5 stars in 2016 and rated the 'best speed camera detector to buy in 2017′ by Carbuyer UK. 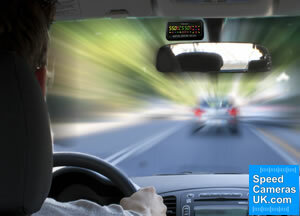 You can change the alerts you receive when approaching a speed camera location using the simple to use menu. 1. 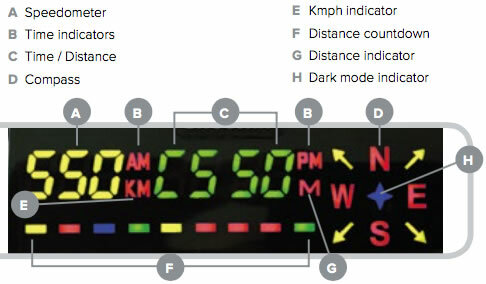 Receive up to four informative spoken voice descriptions when approaching each speed camera location making you aware you are approaching an accident black spot location where there is a speed camera located. 2. Overspeed tone if you are driving above the speed limit at the speed camera location. ‣Requires subscription £19.99 for 3 years or £34.99 for lifetime subscription. The subscription price is £19.99 or £34.99 depending on the subscription option chosen. Speed camera subscription which is required for the Cheetah c550 to provide alerts to both fixed and mobile speed camera locations via the Trinity 3.0 speed camera database costs either £19.99 for 3 years GOLD membership or £34.99 for PLATINUM lifetime subscription. GOLD membership provides 3 years unlimited updates for a single region - choose from: 1. UK and Europe, 2. USA and Canada, or 3. Australia and New Zealand. Question: I might be a bit thick here, but I want to buy a cheetah c550 and watched videos of these in action. None of videos show it approaching a mobile speed camera van or tripod, do they detect these before actually seeing them? Answer: The Cheetah c550 does not detect mobile speed cameras, instead these locations are within the updateable GPS speed camera database. Named the Trinity database it includes fixed and mobile speed camera locations. Question: Does the c550 work with a heated windscreen? Answer: It would depend on your vehicle (make/model) and how the windscreen is heated. 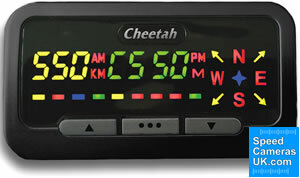 However, the great and unique thing about the Cheetah c550 is the fact that if your vehicles windscreen does block the GPS signal getting through you an plug in the optional external GPS antenna to remedy the situation. The Cheetah c550 exteranl GPS antenna can be purchased via the Cheetah c550 accessory webpage. Question: Can the Cheetah c550 be hardwired so when you start your car it will come on? Answer: Yes, you can use the Cheetah c550 2 metre Hardwire Power Cable accessory and connect it to an ignition switched supply. Question: Can you please confirm whether the Cheetah 550 has a rechargeable battery and also let me know if it can be powered from the usb socket? Answer: The C550 does not contain a battery. It requires 12v power from the car to operate. (It is not intended to be powered via a USB socket in the car). View Cheetah c550 accessories. Cheetah c550 - What's in the box?